triggered public criticism of the draft constitution, which is to be brought to referendum on December 15, 2012.
suspicion of criminal activity or treason (152). (176) and must approve every law legislated by parliament (104). still has the right to appoint up to 10% of them (Article 128). require him to appoint a vice president. that prisons will be monitored (37), and forbids prisoner torture (36). Muslim jurisprudence is the primary source of legislation (219). It also restricts freedom of religious worship to members of the monotheistic faiths (43). prime minister, Dr. 'Ali Al-Silmi, in November 2011.
to restrict the military's authority in the new constitution. The draft constitution indeed addresses the controversial issues. courts in cases of offenses "that harm the armed forces"
military, as opposed to the general judiciary section (198). elected by a general assembly of judges. Court, in that they override previous rulings by this court. right to strike, and social security and various other services. "Second, the constitution, which we hoped would bring about clear achievements for the Egyptian people in terms of economic and social rights and human development, includes the usual flowery phrases without imposing specific standards or goals upon the state, and therefore offers [nothing] new." "All imaginable rights were mentioned in the draft constitution, just as they were in many previous constitutions - [including] education and scientific research (Articles 59 and 61), healthcare (62), employment (64), social security (65), benefits (66), housing, water, and food (68), and even sports (69), and the care of children (70) and the disabled (72). However, there is no requirement [that the state] produce results, allocate resources, or even do anything more than just talk. In my estimation, this part of the constitution, which has not received the [public] attention it deserves, is one of the weakest sections, because it will not bring about a noticeable improvement in the public's standard of living, and will not meet its needs." "However, these pretty words are empty, since the 2012 draft constitution does not include a single text that explicitly prohibits discrimination between men and women in rights and duties, jobs, education, healthcare services, or benefit payments. Nor does it contain a single text explicitly prohibiting discrimination on the basis of religion or belief. It contains no explicit statement about the state's responsibility to end the various kinds of discrimination, or any prohibition against hatred and incitement on a religious basis. It does not criminalize forced immigration or prohibit collective punishment, nor does it defend cultural pluralism, though Egyptian society is characterized by cultural richness and diversity... The new constitution neither defends nor ensures equality between citizens because it largely ignores this issue, perhaps in order to avoid embarrassment, or else out of the assumption that ignoring it is enough - when [the fact is that] equality among the sons and daughters of a nation is the most important message in all the constitutions of the world. "Fourth, many of the suggestions made by [various] professional unions, associations, and parties regarding rights and guarantees they hoped would appear in the constitution ultimately went unheeded. Sadly, many of those who read the final version of the draft constitution assess it only according to what they find in it, and ignore what is absent and could have been included in it. [For example], Article 70 on the rights of the child does not define the age of minority and does not defend children [against abuse] inside the family. The constitution does not include any text banning torture (Article 36 prohibits the torture of prisoners, but not of citizens in general). "In addition, [the Constituent Assembly] withdrew its original [intention] to ban imprisoning [journalists] for publication violations; nor does the constitution include the proposed prohibitions on human trafficking, underage marriage, and the violation of women's rights. Additionally, [the Constituent Assembly] did not heed the suggestion to include a clause guaranteeing resources and services for women in order to help them combine their roles in the family and in the [job market], and defending women from violence and guaranteeing their right of inheritance..."
"Fifth, turning to [the issue of] the state's political system, we find that, with regard to the legislative branch, the draft constitution leaves the [upper house of parliament], the Shura Council, in place, though [this body] is superfluous - especially since, according to the draft constitution, it is elected by the same procedure as the Senate [i.e. the lower house of parliament, previously known as the People's Assembly]. This means that we will have two houses of parliament, [both elected] in the same way and with more or less identical authorities, [except that] one will convene in a green hall and the other in a red hall, and the two will doubtless spend most of their time smoothing out their differences and debating rules that they must agree on. "Sixth and more importantly, the draft constitution includes a puzzling clause (Article 231), which states that it has suddenly been decided, without prior warning, that 'two thirds of the seats [in the parliament] are to be won by a list-based electoral system and one-third by individual candidacy, with parties and independent candidates allowed to run in each.' This [clause] is puzzling because... that was the procedure used in this year's [People's Assembly] election [held between November 2011-January 2012], which was bad because it combined all the drawbacks of the list-based system and all the drawbacks of the individual [candidacy] system. Moreover, this addition [to the draft constitution] was made at the last moment, and precluded an understanding between the political forces on this issue [by preventing] a debate on it. "Seventh... Article 229... reinstates the reservation of half the seats in parliament for workers and farmers. But, since the purpose of this article is [merely] to gain popular support rather than to achieve useful results, [the article] defines 'worker' as 'anyone who is hired by another for a fee or salary.' This basically refers to the entire Egyptian people, with the exception of businessmen and white collar workers..."
"Eighth, when it comes to the armed forces, the [Constituent Assembly] did not realize all the expectations or heed all the suggestions that were made by the political forces over the last year. [At first,] the principle that civilians are not to be tried in military courts seemed to be taking root in the [draft] constitution, but then, along came Article 198, which ignored this and restored the permission to try civilians in military courts for offences against the armed forces (to be defined in a subsequent law). It was also stated that this law (to be passed at a later date) will define the rest of the authorities of the military court system - which opens the door to restoring the control of the military courts over civil society. "As for the complicated issue of the armed forces' budget, and the question of whether the parliament is authorized to debate it as it debates the state's budget as a whole, Article 197 ignores the numerous alternatives and impartial concepts that are used around the world to maintain the balance between considerations of national security and the people's right to oversee the national budget. [The Constituent Assembly] chose the worst alternative, granting sole authority to discuss the military budget to the National Defense Council, which is to include, from the legislative branch, only the heads of the People's Assembly and the Shura Council, while the majority of the members of this council are from the military itself. What kind of oversight is this?" "Ninth, regarding the president of the republic, it is surprising to hear from the defenders of the constitution that his rule and authority are severely curtailed. This may be true, but how do you respond to the fact that, [according to the draft constitution,] the president of the republic is the head of the executive branch (Article 132)? [Moreover,] he appoints the prime minister (139), determines the country's general policy (140), is in charge of defense, national security, and foreign policy (141), heads government meetings whenever he wants (143), and ratifies international treaties (145). He is [also] the commander-in-chief of the armed forces (146), and [may] appoint and dismiss civil and military personnel (147), declare a state of emergency (148), grant pardons and commute the prison sentences of convicted criminals (149), and call for referendum (150). He appoints [up to] 10% of the Shura Council delegates (129), as well as the members of the Supreme Constitutional Court (176) and the heads of all oversight mechanisms (202), and he is the head of the National Security Council (193). "Furthermore, the draft constitution does not require him to appoint a vice president, so he makes all these decisions without involving a possible successor. If this is not absolute authority, what is? If you require further evidence of the expansion of the president's authority, look at the government's powers (159), and you will see that it is devoid of means and authority and is limited to [roles of] 'collaborating [with the president],' 'directing' [and] 'preparing' projects, and 'following [them] up'. All these are authorities befitting the office of the president of the republic, not the government that runs the country." "Tenth, let us set aside language and look at the conditions under which this constitution is being issued. How can we ignore the fact that it was drafted by an assembly of questionable authority, [since] the People's Assembly that appointed it has been disbanded by court order? [How can we ignore the fact] that one political faction insisted on controlling it from the start? That all delegates of the secular stream withdrew from it in protest over its takeover by the [Islamic] majority? That it was boycotted by Egyptian churches? That two professional unions - the Attorneys Union and the Journalists Union - objected to its activity? That the president of the republic issued a tyrannical constitutional declaration to bullet-proof its makeup and its resolutions? That the Supreme Constitutional Court was besieged so it wouldn't rule on it? And that its final draft was hastily ratified? "How can we hold a referendum on a constitution that was supposed to be agreed upon, when it has [actually] become a symbol of schism and of trampling the rule of law? The finished product cannot be [viewed] separately from the circumstances and method of its issuing. The way this constitution has been forced upon society, and the claim that we must choose between accepting it and living under a tyrannical constitutional declaration, is reason enough to object to it. "For these reasons, I call upon you to reject the constitution. Do not believe that the referendum is about choosing between a civil [state] and a religious [one] because, in reality, the choice is between democracy and dictatorship. Don't believe that consenting to this pathetic constitution guarantees us stability, security, and economic prosperity - because the only things that will bring us closer to all those [goals] are concord and unity, rather than division and schism. Do not be afraid to object to this constitution out of a belief that [your] objection will lead to chaos. There are many possible alternatives that are preferable and can lead to true stability. Do not be afraid to object to the constitution, because it essentially does not fit this country." *L. Lavi is research fellow at MEMRI. See MEMRI Inquiry & Analysis Series Report No. 904, An Examination Of Egypt's Draft Constitution Part I: Religion And State - The Most Islamic Constitution In Egypt's History, December 3, 2012; and MEMRI Inquiry & Analysis Series Report No. 906, An Examination Of Egypt's Draft Constitution Part II: The Egyptian Public Debate Over Religion And State, December 5, 2012. This report is based on the latest draft constitution published on the official website of the Constituent Assembly on November 30, 2012. See MEMRI Inquiry & Analysis Series Report No. 907, Egypt Under Muslim Brotherhood Rule: The Constitutional Declaration - Dictatorship In The Name Of The Revolution, December 7, 2012. Al-Shurouq (Egypt), December 10, 2012. Al-Watan (Egypt), December 10, 2012. Al-Dustour Al-Asli (Egypt), December 4, 2012. See MEMRI Inquiry & Analysis Series Report No. 762, Egyptian Deputy PM's Document of Constitutional Principles: An Attempt to Bolster Military Supremacy, Curb Islamists' Influence on Constitution, November 16, 2011. Al-Ahram (Egypt), October 23, 2012. Al-Ahram (Egypt), June 15, 2012. See MEMRI Inquiry & Analysis Series Report No. 865, The Egyptian Revolution Is Only Starting: Will Power Be Transferred From The SCAF To The Elected President And Parliament?, July 30, 2012. Al-Shurouq (Egypt), December 5, 2012. 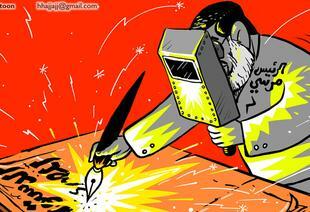 Translation of constitution articles: egyptindependent.com, December 2, 2012.